NEW ORLEANS – This past weekend featured limited NCAA Division II country action, keeping the status quo largely – but not entirely – intact for Tuesday’s Regional Team Rankings released by the U.S. Track & Field and Cross Country Coaches Association (USTFCCCA). The rankings in three men’s regions and three women’s regions remained perfectly static from a week ago – with two more regions for both genders experiencing but a lone swap between two teams – but several others featured new teams moving into position to qualify for the NCAA Championships December 6 in Louisville, Kentucky. Only a pre-determined number of teams from each of the eight regional championships – scheduled for a month from now on November 22 and 23 – will make it to the NCAA Championships. Being ranked among the projected qualifiers is one thing; making it happen in late November, of course, is another. The Southeast Region will send three teams to NCAAs on both the men’s and women’s side, and this week’s rankings featured new top-three teams for both genders. North Georgia‘s women dropped two spots to No. 4, paving the way for Wingate to move up a spot to No. 2 and Mars Hill to leap up four spots to No. 3 following runner-up and third-place finishes at Montevallo, respectively. King‘s men also ran well in a third-place finish at Montevallo to jump two spots to No. 3. In the men’s South Central Region – which will send six teams to NCAAs, tying the West for the best-represented region – UC-Colorado Springs moved up one spot into that all-important sixth slot with a fifth-place showing at Fort Hays State. The Mountain Lions swapped spots with Metro State. A team that didn’t quite break through into their region’s projected qualifiers but came close were the Nebraska-Kearney men. The Lopers moved up to No. 5 in the Central Region – which will send four teams to NCAAs – with a third-place finish at Fort Hays State. The lone new teams to this week’s rankings for either gender were the men of MSU Moorhead (Central) and Georgia College (Southeast). Regionals will be held around the country on November 22 and 23. 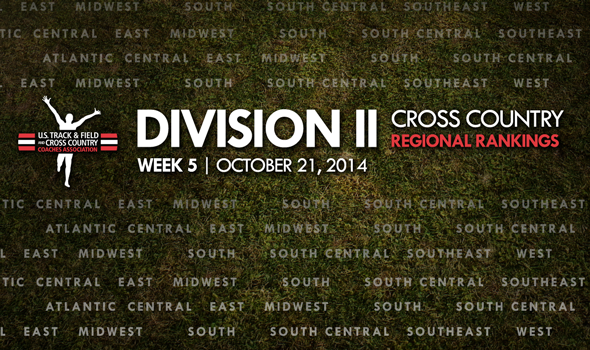 More information can be found on the USTFCCCA’s Regional Championships Central.